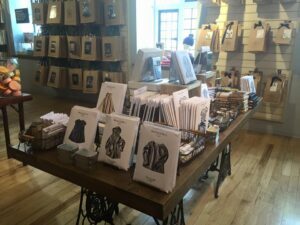 A recap of her experience on the walking tour of Savile Row and other shopping excursions while studying abroad by Ashley Outhouse. The first part of our day was spent walking up Savile Row and learning about the different tailors that have shops there. Savile Row is a street in Mayfair, London known for its traditional bespoke tailoring for men, which is clothing made to an individual buyer’s specifications by a skilled tailor. Bespoke is a term that is said to have originated on Savile Row, meaning that a suit is cut and made to fit. From the street view, you can even see the workshops below the store fronts where they [tailors] construct the suits. 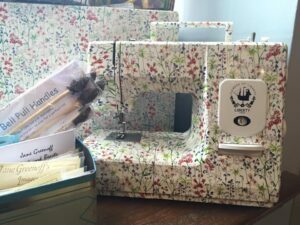 You can view them drawing up the patterns, cutting out the fabric, and even sewing it together. Tailors were drawn to the area in the late 18th century because of the nature of the residents of Savile Row. Some historic customers that have purchased suits from Savile Row include Winston Churchill, Prince Charles, Napoleon III, and Lord Nelson. Henry Poole, one of the oldest tailors opened an entrance to their shop on Savile Row in 1846, and the shop is still in business. 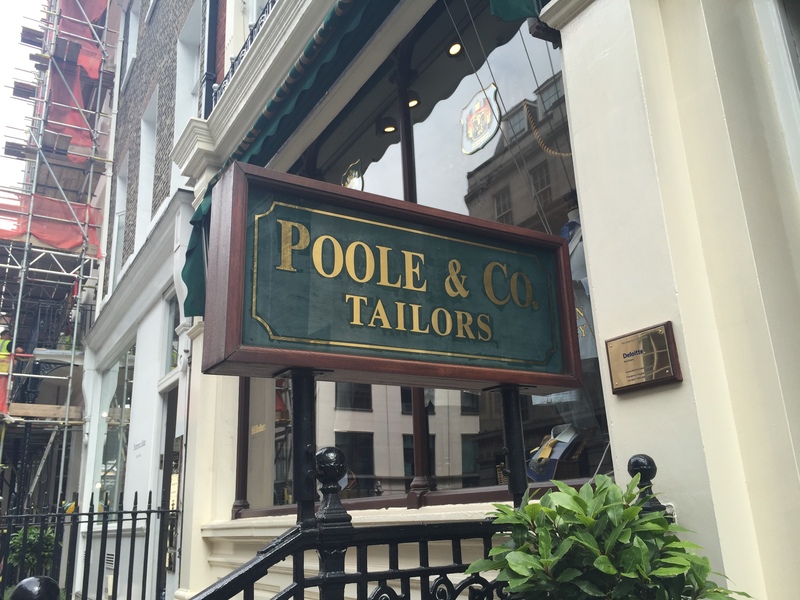 The picture below shows the Poole & Co. Tailors sign that is located on the front of the building. The next place we visited was Liberty London. This place is so magical. Liberty is well known for their floral and graphic prints as well as their selection of luxury goods. The four floors of wall to wall merchandise can be a little intimidating at first, but after looking around for a few minutes you’ll fall in love. My favorite section of the store was the haberdashery and fabric sections. You can find everything in iconic liberty prints including sewing supplies, stationary, housewares, clothes and more. 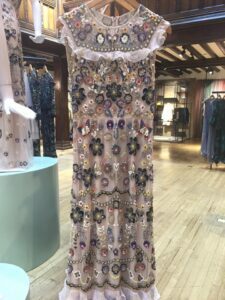 Pictured below is a dress from the Needle & Thread collection at Liberty. These dresses are embroidered from top to bottom and are even more beautiful in person. The bead work is just phenomenal and the color combinations are to die for. Towards the end of the day, we explored different fabric and haberdashery shops also in the area. We toured MacCullouch and Wallis, Cloth House, The Silk Society, Misan Textiles, and additional small shops. The cost of some of the nice silk fabrics could range all the way up to over a hundred pounds per meter. The quality of the products here is unlike anything in the United States. After coming to London, all of the specialty fabric shops don’t even compare to JoAnn’s.